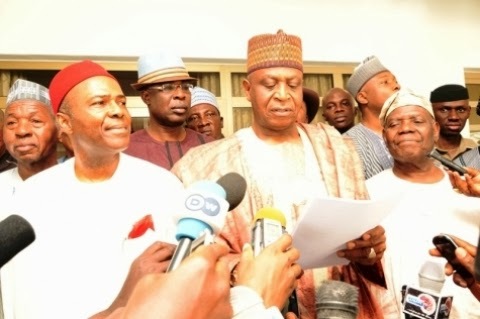 New PDP and APC has merged today in Abuja and the above photo is a photo of the announcement of the merger between officials of the two parties. Some of the faces at the merger includes Ogbonaya Onu, nPDP chairman, Kawu Baraje, Senator Bukola Saraki, Governor Rotimi Amaechi, former Lagos Governor, Bola Tinubu, chair of the APC, Chief Bisi Akande. I don't see this having a happy ending though.